In honor of our recent reissues of prolific musician and producer Haruomi Hosono’s essential albums, we teamed up with dublab and In Sheep’s Clothing’s, a hi-fi bar in downtown Los Angeles, for a night of celebration. Special guest Kuni Murai — famed producer, composer and founder of Alfa Records, joined dublab’s Mark “Frosty” McNeill for a chat about his decades-long working relationship with Hosono, from his days as a session player to his stratospheric success with Yellow Magic Orchestra and beyond. Please note, we have removed the music sections due to right's issues. 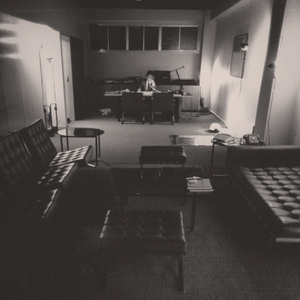 Photo: Kuni Murai at his Alfa Records office, located directly below the label's famed Studio A in Shibaura, Tokyo.